I first published this article in 2016. Now that I have made a new video demonstrating the differences between the Couperin piece in his original notation versus what we see in the Anna Magdalena Bach Notebook, I decided to republish. I hope this subject will be food for thought, leading to some experimentation with finger pedalling as an added means of creating resonance. Pianists have always felt that the music of J S Bach is accessible to them. The Early Music Movement (1970s wave) did put some pressure on those of us who presented Bach’s music to do so in particular ways that were perhaps more suitable to the instruments of his day than our mighty grand pianos, but fortunately the greatness of the music transcends the medium – harpsichord, piano, synthesiser, whatever. The perennial question of pedal always comes up when discussing Bach style on the piano. The argument goes that, because Bach’s instruments were not equipped with any sustaining mechanism, we should steer clear of our right pedal (for some players this means completely). “The pedal is to the piano as the vibrato is to string players. Both must be applied with care, control and in moderation. Clarity is essential with Bach, the purity of counterpoint and voice leading must be self-evident, never muffled or confused. Thus a discreet use of the pedal is not forbidden as long as these rules are observed. The question remains whether it is beneficial to the music to look for easier solutions. A perfect legato on the piano is an impossibility, and one can only create an illusion of achieving it. To attempt this with the hands alone is much more difficult but it’s well worth trying. Bach certainly didn’t want his music to sound easy; it’s demanding for players and listeners alike.” – Sir András Schiff. Here is Sir András discussing the subject with Arie Vardi in a television interview (watch from 1:17). How interesting to discover that, in his remarkable performance of the Goldberg Variations in last year’s Promenade concerts, Sir András did make discreet use of pedal in the cavernous space of London’s Royal Albert Hall (you can watch the performance here). When I was a harpsichord student, one of the first things I learned was overlapping touch – or “finger pedalling” – and this opened up a whole new world of sound possibilities for me when I came back to the piano. We pianists have been taught to hold notes for their written duration – and no longer! However, harpsichord players control the dampers (yes, harpsichords absolutely have dampers) by their fingers, since this is the only means at their disposal to add resonance to their sound. Thus in a harmonic texture and even in melodic lines, they hold notes beyond their written value. It’s not only a good idea, it’s a necessity. Here is the opening of Bach’s Partita no. 6 in E minor as notated by Bach. And here is how it would be notated if we transcribed the finger strokes of a typical harpsichordist. Way too cumbersome to write it out fully in this way – and unnecessary, since overholding was an aspect of style players in Bach’s day (and well beyond) would have completely understood. For a video demonstration of this opening, please follow this link to my Online Academy article on spread chords in the Baroque period. Have a look at F. Couperin’s Les Bergeries and Anna Magdalena Bach’s copy of it in her famous notebook. Couperin writes the LH in what looks like two voices, using complex double stems and ties, whereas Frau Bach dispenses with such intricacies of notation. Couperin and other French composers of the period were control freaks in matters of notation, German composers assumed the player would know what to do. However, it gets a little confusing when you compare places in Bach’s music where he does indeed write in such overholdings in a more deliberate way, such as the LH of the Goldberg Aria. This compositional technique has come to be known as style brisé – broken up in imitation of the lute. Sometimes Bach writes in style brisé, other times not – but the execution is undoubtedly the same (check out the first and second endings of the Allemande from the Partita no. 1 in B flat – the first ending written in overlapping style, the second ending in simple notation). A great piece for pianists who wish to develop their finger pedalling skills is F. Couperin’s miniature masterpiece Les Baricades Mistérieuses, from the Ordre 6ème de clavecin. When I play it, I trick listeners into believing that I must be using the pedal – but I use none! All of the resonance is created by my fingers alone. 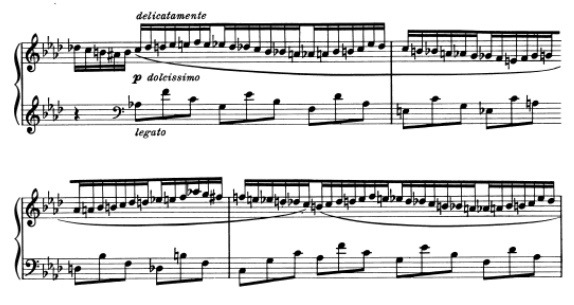 I find myself using finger pedalling in music from all periods, including in this example from Liszt’s Concert Study, La leggierezza. I tend to hold on by hand to the first note of each beat in the LH, producing a legatissimo touch. This frees me up from relying solely on the pedal for resonance. I keep my foot in contact with the pedal, adding short, shallow dabs to my sound to liquify – being careful not to drench it. Thanks for sharing this bit on finger pedaling! Baroque repertoire (and thus techniques like finger pedaling) is my weakest area, so thanks for sharing the Couperin piece as a suggestion. And good to know that you utilize the technique in more modern pieces like Liszt’s.